Los Reyes Del Desmadre (Potro Jr. & Sergio Romo Jr.) are the current champions. The championship was introduced in 2014. Bengalí and Difunto I were crowned as first champions by defeating Galactar & Rico Rodríguez in finals of 16-Team Tournament to crown the first champions. Los Reyes Del Desmadre (Potro Jr. & Sergio Romo Jr.) began to shown themself with the titles in 2017. There's no archivement of they defeating former champions by the belts. On December 1, 2017, after successfully defend their titles against Ángel Galáctico and Enky, Tamaulipas Box And Wrestling commissioner César Johnson stripped they from the championships, arguing an illegal intervention of Dylong to help the champions to retain their titles. Potro Jr. and Sergio Romo Jr. were reinstated as champions soon later. 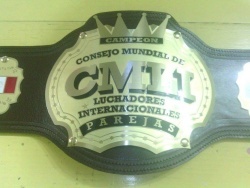 ↑ Tamaulipas Box And Wrestling commissioner César Johnson held up the titles after Dylong interfered in the match to help the champions to retain their titles. Potro Jr. and Sergio Romo Jr. were reinstated as champions soon later.